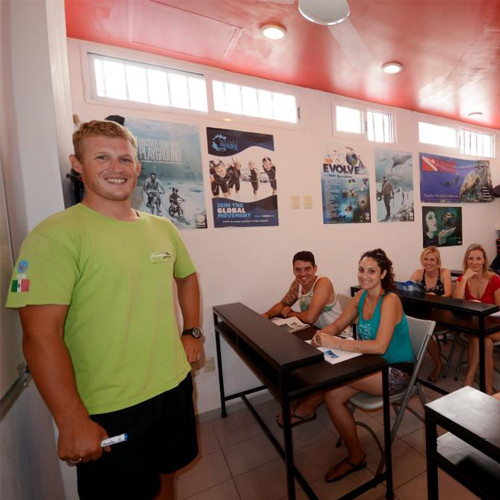 Welcome to our PADI 5* IDC Center and Training Facility – You are training with the very best! 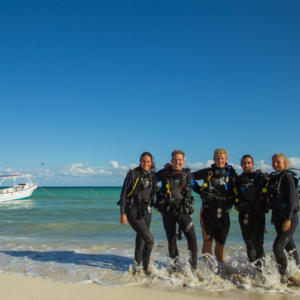 The PADI Open Water course is the most popular entry level certification recognized world wide and opening all sorts of doors to all sorts of incredible new experiences! 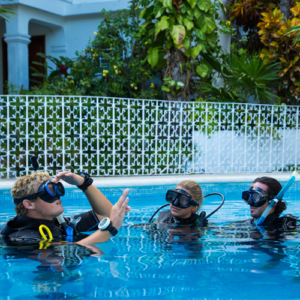 Here at Scuba Playa we offer a variety of study options to ensure your training fits with your vacation schedule and your family! The Open Water Course consists of 5 knowledge development sessions using your student manual combined with the Open Water Diver video (available in many languages) 5 confined water sessions (done over two swimming pool sessions) and 4 open water training dives. An alternate otion to studying using the manual and video is to sign up for e-learning before you arrive and get all the theory done before leaving home! Then the water session are the only thing you need to schedule for when you arrive! Option One: Sign up for PADI E-Learning here using our PADI Store No. 21034 to ensure you are affiliated with our Dive Center. Once you sign up we will receive notification when you start and when you finish! Contact us to book your confined and open water training. This will take place over two complete days starting at 8.00am each day for the confined water session and heading out in the afternoon on both dives to complete your 4 Open Water dives. Option Two: Day One you will be comfortably watching the Open Water Diver Video in one of our air conditioned classrooms and then head home to complete the knowledge reviews based on what you have learnt from the video. Day Two will be reviewing the first part of the theory you have completed along with your first confined water session and first two open water dives. Day Three will be similar although you will be doing the last confined and open water training dives! The first day you can choose any time between 9 am and 5 pm to watch the videos for 3 hours. Next two days you will be with us from 8 am until 3 pm. All our Open Water Courses included full equipment rental: Buoyancy Control Device, Regulator, Wetsuit, Mask, Snorkel and Fins. Also included is a Diver Log Book for logging all your training sessions and subsequent Open Water Dives. If you take the e-learning option you will need to purchase a logbook once you arrive at the shop. Also included is your PADI Certification Fee, Recreational Dive Planner and Student Manual. For e-learning you will have access to all these materials online. 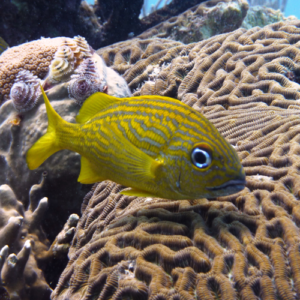 Our group sizes are small with no more than 4 divers per group in Open Water. Your first two open water dives will be up to a depth of 12m/40ft and your last two dives up to a depth of 18m/60ft. Depth restrictions for children of the ages of 10 and 11 are 12m/40ft with no more than two children in this age range per group.